Senior Content Marketing Strategist Emily Clark knows a thing or two about hard work. Not only does she work hard each and every day on her clients’ marketing strategies, she also put in some of the hardest work of her life this past April when she ran the world-famous Boston Marathon. She said training for and completing the marathon was one of the most rewarding and challenging experiences of her life. 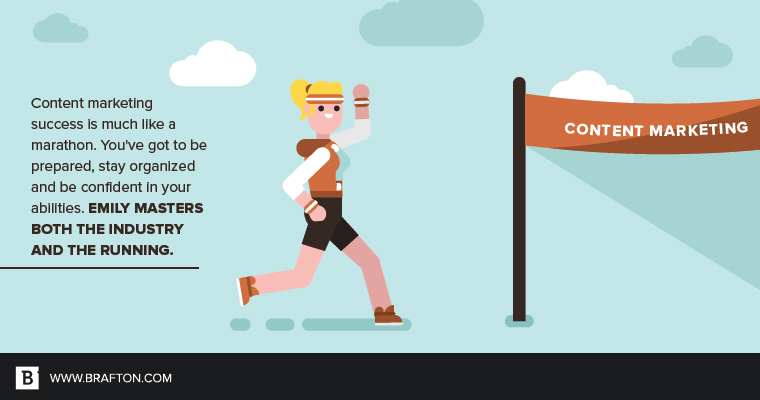 Who would have ever thought that some of the skills used to run a grueling marathon are the same as those needed to succeed as a content marketer? Being dedicated and staying on top of everything is one of the reasons that Emily is so great at her job and why she consistently keeps a portfolio of satisfied clients. Truth be told, Emily didn’t even fully understand exactly what content marketing entailed until she started at Brafton. However, she’s always had a passion for content from a young age. Growing up, she loved reading and writing, and would compose her own short stories. She even set her sights on becoming a journalist for The New York Times. However, the intensity of New York City (“I can’t handle NYC for more than 48 hours.”) and a small stint as a sports reporter in college (“After a while, I decided I didn’t really love sports enough to make it my line of work.”) led Emily to check out what career opportunities she could pursue in content marketing. She came on board at Brafton in 2014 as a Social Media Specialist, but as she was exposed to the different facets of the industry, it took very little time for her to realize that she wanted to be more involved in every aspect of client strategy. She joined the Account Management team as a CMS six months after starting. I knew, after learning what exactly needed to be done for our clients to see success, that I wanted to be a CMS and work with our clients directly. She even focuses on content in her spare time by running her personal blog As Told By Emily. She explained the blog started as a way for her to document her recovery from an eating disorder, but it has now turned into her journey with everyday body image issues as well as her tips and tricks for positive thinking and optimism. Despite not knowing much about the content marketing industry until she started her career in it, Emily has proven to be a skilled and enthusiastic CMS. But, she said, working in this field doesn’t come without its challenges. Perhaps one of the biggest hurdles content marketing strategists face is making sure they are always one step ahead so they can help their clients succeed not only today but in the future. You have to be agile, you have to be organized and you have to be confident in your strategies. Also, Emily has to often advise her clients on what will absolutely not work for their marketing efforts, even if a client has their heart set on it. One of her favorite parts of her job is when she gets to work on those marketing aspects that she knows will get her clients the results they want. When clients ask her which upcoming marketing trends they should implement, Emily immediately points to custom imagery. Including custom images in blogs significantly boosts engagement, she explained, and they can be easily repurposed and reused across multiple marketing channels, such as email and social media. I think it’s so cool to transform a digital presence with a website redesign. It’s a game changer. What does Emily think it takes to be a successful content marketer? Again, those are some of the skills that she took from her content marketing expertise and applied to her training for the Boston Marathon. But I think we all want to know: Will she be running the distance again in 2018?